Renting a home for your family vacation in California means you can sidestep daily hotel fees, but that’s not the only appeal. Staying in a house affords all the comforts of, well, home — a full kitchen to use when you like, laundry facilities, and a broken-in, cushy living room sofa (perhaps one with a built in-bed) a hotel room may lack. Even better, you definitely won’t be sleeping one wall away from a noisy ice machine. 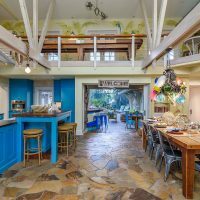 Staying in a vacation home in California can also help you get away from the tourist bustle to experience the laid-back Cali vibe that draws people from all over the world. These are some of the best destinations for renting a home for your experience in the Golden State. If the Hollywood shuffle isn't for you, Big Bear Lake might be just the antidote. While most Los Angelenos think of this mountain town for a quick ski getaway, Big Bear is an all-season resort with something for everyone. Because so many skiers and snowboarders descend on the town's two main ski areas Ã¢â‚¬â€œ Snow Summit and Bear Mountain -- in winter, there's an abundance of rental cabins and houses ranging from humble to practically palatial. That doesn't mean the fun is limited to winter, however. 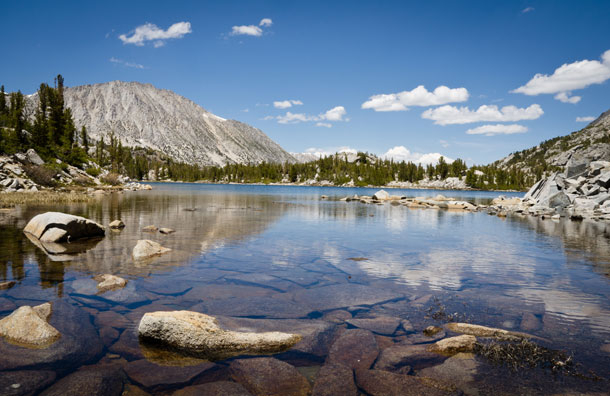 At seven miles long and one mile wide, the lake itself is California's largest recreation lake. Fishermen can hook trout, bass and catfish, while others can hit the water for jet skiing, kayaking, wakeboarding, waterskiing or other water sports. Hiking, mountain biking and horse riding are also popular picks. Kicking back and relaxing may be the town's main activity, with bald eagles and the occasional grizzly bear sometimes part of the view. Those planning to cook a fancy meal in their rental home may want to stock up before making the 40-mile drive up the mountain, as shopping choices in town are utilitarian (think meat and potatoes, not specialty goods). Also expect plenty of traffic around the lake during prime ski times. What some call America's biggest suburb, Los Angeles lends itself to the comfort of a vacation home. Hot spots range from a revamped Chinatown and the historic (and supposedly haunted) Queen Mary in Long Beach to tourist meccas like the Hollywood Walk of Fame and the Museum of Contemporary Art in the newly revived downtown. There's something for everyone -- as long as you're willing to drive. While there is a subway, it doesn't go everywhere and not all parts of the city are pedestrian-friendly. With so many places to visit (and so much traffic to fight), picking a vacation rental may require some consideration about what you most want to see while in town. If your kids love parks and animals, for example, picking a house near Griffith Park's 4,310 acres (the second-largest park in America) gives you access to the L.A. Zoo, Griffith Observatory, Greek Theatre, two train-themed museums, pony rides, playgrounds and a plethora of hiking trails and picnic areas. Hollywood has countless celebrity-themed museums, as well as familiar locations from film and television, while Santa Monica has chic restaurants and plenty of beach access. 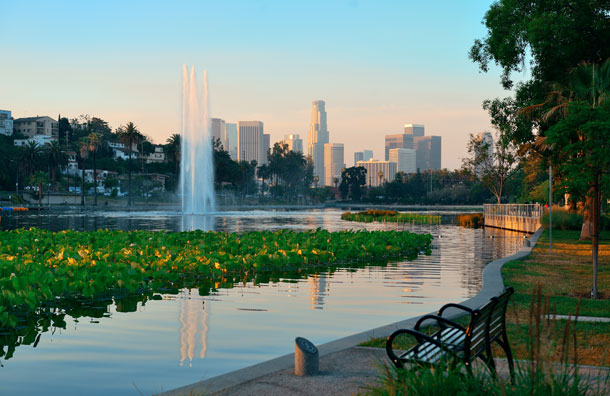 As the second-largest city in the U.S., Los Angeles has a lot to enjoy Ã¢â‚¬â€œ so plan accordingly, and know it may take a few visits to see everything you want to see. Famous for its iconic Golden Gate Bridge, San Francisco is a big city squeezed into a relatively small space (just 49 square miles). 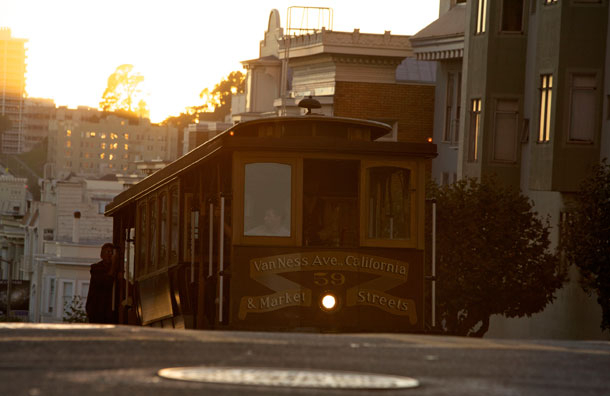 The city's hilly streets, period architecture and cable cars make the most densely-settled city in America a tourist draw year-round. San Fran has a great, easy-to-master public transportation system and plenty of parks, museums and restaurants, plus visitors can't miss listening to the sea lions off Fisherman's Wharf or visiting Alcatraz. What San Francisco doesn't have is an abundance of cheap family accommodations. However, rental houses and apartments can be a more reasonable option than hotels, especially if you're planning to stay for more than a few days. The money you save can be spent on tickets to any of the city's internationally recognized operas, theaters and ballet companies, or visiting the oldest Chinatown in the U.S. Just remember to take a jacket -- even when the days are sunny, it can get downright chilly after dark. With migrating gray whales often spotted frolicking just off its coastline, Santa Barbara is known for amazing weather (300 days of sunshine a year! ), incredible views and remarkable natural beauty. But it's also known as the American Riviera for its charming Spanish-style architecture, fancy restaurants and upscale shopping. The good news is that, even if mom and dad decide to have a grown-up dinner or visit the many wineries in the area (there's even an Urban Wine Trail to follow in town), the whole family can have plenty of fun the rest of the day hiking, biking, exploring the nearby Coronado Butterfly Preserve or visiting the traditional Danish town of Solvang (it has its own authentic Danish windmill). 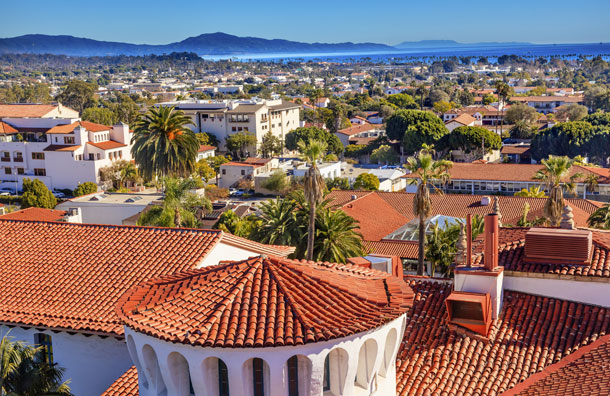 There are rentals ranging from waterfront mansions to cozy condos, but you'll pay for primo locations (it's worth noting that the average price of a single family home in Santa Barbara was over $1 million in 2013). But if you're looking for a little luxury, you can find such amenities as personal pools, panoramic views and direct beach access. There are also fewer rentals to choose from than in other California cities, so advance booking is best. With 70 miles of beaches, San Diego is a year-round paradise for families looking to relax in the sun. But parents and kids might have a hard time kicking back with so many enticing places to explore in town. Known as the "Smithsonian of the West," Balboa Park is made up of 15 museums and it's an ideal spot for both fun and education. It has the nation's largest multi-sport museum, a model railroad museum and an IMAX theater presenting science-themed programs. For more lighthearted fun, there's also the world famous San Diego Zoo, San Diego Zoo Safari Park and Sea World San Diego. The eastern edge of San Diego County has Anza-Borrego Desert State Park, the largest state park in California with over 900 square miles to explore. Rentals in San Diego run the gamut, from charming beach cottages to luxury apartments and even house boats -- and prices can be just as varied. 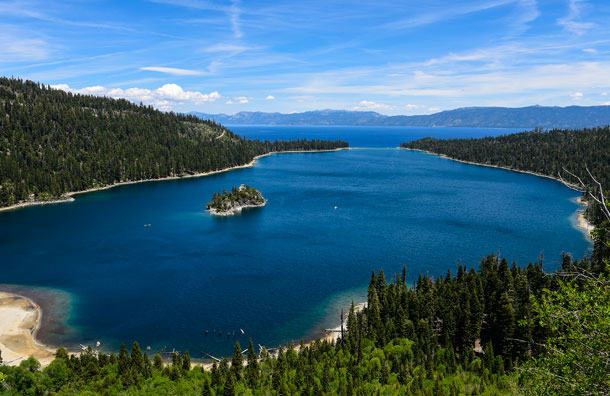 Located along the border of California and Nevada, Lake Tahoe has one of the largest, clearest and deepest freshwater lakes in the world. It is almost a mile above sea level, and offers exceptional skiing in winter and cool summer temperatures for watersports, biking and golf. It's no surprise nearly 3 million visitors descend on the area each year. Even with so many visitors, there's an abundance of rental homes in the area ranging from one-bathroom cabins to massive homes perfect for large gatherings or big families. 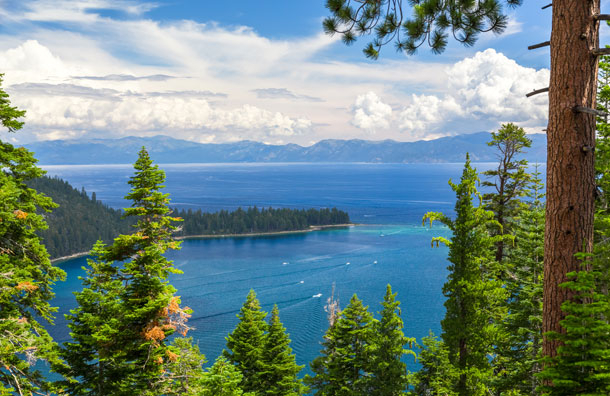 Most visitors gravitate toward South Lake Tahoe (close to casinos, as well as the Heavenly Valley Gondola, which takes visitors almost 3,000 feet above lake level), though Tahoe City is also popular. The area, which has a relaxed, low-key sensibility, has many restaurants and boutiques, plus plenty of places to rent sporting equipment when your kids can't live another second without kayaking the lake. 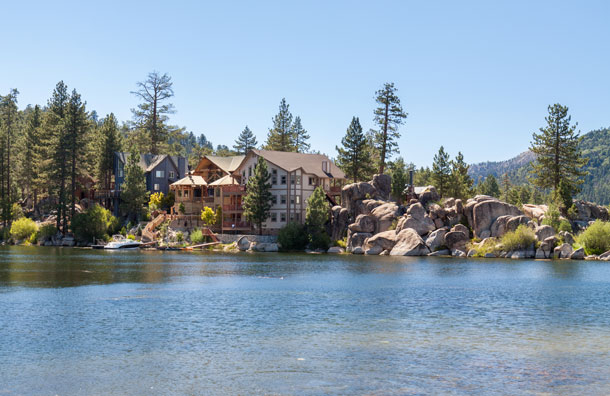 For families really looking to unplug, Mammoth Lakes may be just the thing. A popular pick for Los Angelenos looking for a ski weekend, Mammoth slows down in summer -- and prices for hotels and rental homes drop accordingly. While you can hike, fish, golf, horseback ride or bike in the area and take advantage of the cool temperatures during the warmer months, Mammoth Lakes is also a great place to settle while exploring the surrounding sights. The biggest draw is nearby Yosemite National Park. While campground sites are usually reserved in advance, a bus ride directly into the park from Mammoth Lakes is just $20 for those interested in taking a day trip. There's also the ghost town of Bodie, Mono Lake, or the Manzanar Internment Camp to explore, but the natural beauty of Mammoth may be enough. 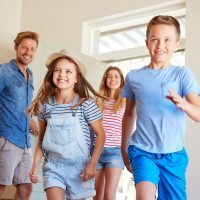 If you've given in to the kids' requests to visit Disneyland, LEGOLAND California and the San Diego Zoo, being able to unwind at a rental home in Oceanside might be the ideal way to grab some "me" time, too. While you'll have easy access to all the amusement parks, you'll also find Oceanside lives up to its name. With six miles of frontal beach roads ideal for jogging, biking or skating, you can enjoy sea breezes while getting your heart rate up. The beach is also a magnet for surfers (and if you're not one yet, local surf schools offer lessons). Golfers can enjoy the six public and private courses in and around Oceanside, too. Of course, being close to the beach doesn't come cheap, but rentals include everything from condos to cozy cottages and homes with waterfront settings. 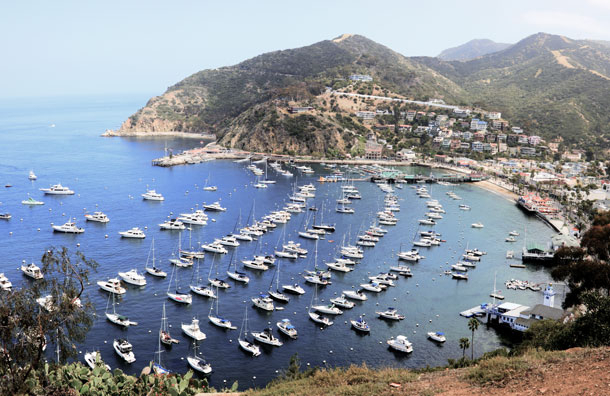 Located 22 miles off the California coast, Catalina Island has under 5,000 full-time residents, but attracts close to a million tourists every year. You can't bring your car (you can reach the island on a ferry from the port of Los Angeles or via boat), but you wouldn't need it anyway Ã¢â‚¬â€œ you can get everywhere you need to go walking or biking. Mostly controlled by the Catalina Island Conservancy, the island is home to an amazing assortment of wildlife, including American bison, 37 resident bird species, sea lions, harbor seals and flying fish. Tourists can take glass bottom boats to explore shipwrecks in the area, or try scuba diving or snorkeling. For the less ambitious, the romantic island has plenty of restaurants and bars on the waterfront, perfect for whiling away an evening or afternoon. Most rentals are condos with remarkable views of the water. Because of the small size of the island, there's a limited supply, so reserve in advance! The upscale, beachfront city of Santa Monica has miles of beaches for daytime fun, but a family-friendly nighttime scene as well. Visitors and locals crowd the Third Street Promenade to catch a movie, grab a bite to eat, or just watch the many street performers. The Santa Monica Pier also has a Ferris wheel, an authentic 1920"s carousel and arcade games if you want to let the kids blow off some steam before dinner. There are plenty of opportunities for retail therapy along the Promenade, in the adjacent (and newly renovated) mall and in the pricey Montana Avenue shopping district. 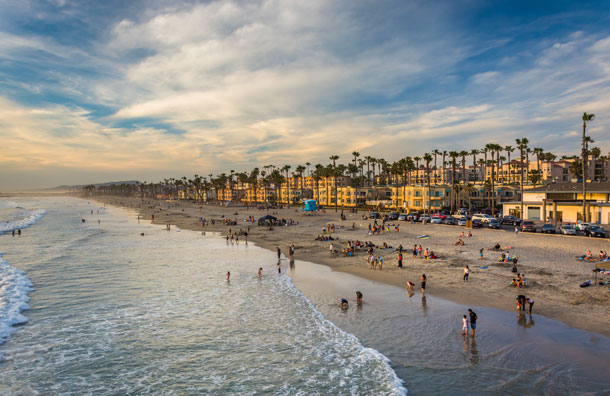 Walk a little further south and you'll find yourself in Venice Beach, home of Muscle Beach, romantic canals, and a wide assortment of restaurants and shops. Since Santa Monica is also an ideal place to set up camp while exploring all that Los Angeles has to offer, renting a house can be key to unwinding at the end of the day. Vacation rentals run the gamut from cottages with Zen-inspired gardens to houses with pools and penthouse apartments.